Through the grief, you lied about your dead husband’s pacemaker. Whether you lied in spite of the grief or through some deliberate defiance, the question didn’t take you by surprise. Most people don’t anticipate the bony, cadaverous face of an undertaker substituting words of condolence with such a callous question as, Did your late husband have a pacemaker? Surprise should follow such a question, a fumbling for words as the bereaved painfully recalls that vulgar piece of metal buried inside their beloved’s corpse. As undertakers, we sensed your lie. The question came up through mere formality. We must ask as if to say, Your husband is no spirit, not yet at least, but still a corpse, a hunk of meat we must dispose of. A dirty, filthy business you ask us to handle for you. Understand then why your answer sounded like defiance. A deliberate lie. “No,” you said, a word that wafted across the room like a puff of air as you dabbed at a tear. In cases of cremation, we require a truthful answer. You may lie about other things. You may lie to us about your belief in an Afterlife. You may lie about your dead husband’s preference in hymns, perhaps his faith as a Baptist. You might even lie about his cause of death. But do not lie when it comes to cremation. Imagine the flames igniting inside our ancient crematorium, the rising heat and pressure and the reaction of the sealant on the metal device deep in your husband’s body. The explosion that follows would astonish you. Know also that our facility, the oldest living structure in Vissaria County, sits on top of porous limestone so susceptible to sinkholes that already parts of the surrounding cemetery have collapsed, mausoleums and corpses swallowed into the depths of an underground river. You would not believe how often mourners have found the ground cave in underneath them, sending them plummeting into a newly formed sinkhole. Often the three of us have found ourselves extending an arm down to some hapless soul clinging to crumbling soil. Imagine the horror we felt at those times when our efforts failed and we found ourselves hoisting up a disinterred skeleton while the unrescued person went plummeting to a suffocating death. When successful, we received showers of thanks and praise, though these words faded when we met this relief with cold indifference. Besides, the person could no longer say for sure which of us had saved him. As triplets, our faces have become all the more indistinguishable through time and age. No one calls us anything but the Scale Brothers. Undertakers, remember. Our lifelong business with bodies buried beneath should shed light on our preference for this term. You made some ill-conceived joke about this word when you came in to discuss final arrangements. 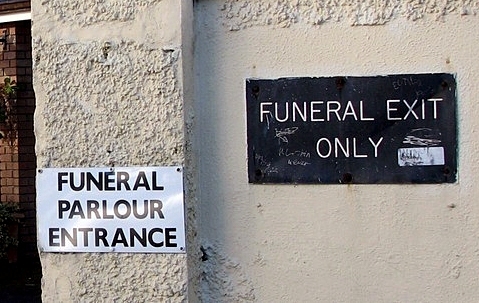 “Why not call yourself a funeral director?” you asked. The face across the desk from you likely winced at that term. The response you received mentioned our mistrust of contemporary terminology. We direct nothing. We undertake a task. We get the job done. Your husband has died. Unexpectedly, one might have added, but that would have sounded like a question, and we do not do the work of law officers. Instead, we promised to bury him for you. We would make room in the sagging cemetery beyond our doors and hope that the earth did not crumble beneath you when you came to bring flowers. Such grief-stricken words. Did the bony face across from you show no sympathy? You must wonder if those rheumy eyes can no longer sparkle or if the aged muscles can no longer hold the lips in the sad smile modern life leads one to expect. The dearly departed are our labor. We undertake a task, after all, and your Marty was our task. The reason you lied escaped us. In an effort to understand, we role-played, one of us sitting behind the desk, another where you sat, and the third standing by to observe and take notes. We acted out the questions, analyzed the reactions, studied the notes, then rotated positions to do it all over again. We took turns playing you and imitating your mannerisms, your way of speaking. We got inside your mind, and imagine our frustration at finding a different one each time. None of us had ever married. Born together, we have known only each other our entire lives. While pondering your marriage to dead Marty, we found that our breathing had synchronized. At our advanced age, we do not breathe quietly. We share the same wheezy rasp, the sound of brown urine falling on toilet paper. During one imitation of you, we felt ourselves feeling great sympathy for you. Waking up next to Marty’s still body shocked you profoundly. You lunged away from him, sat crying on the floor for several minutes before calling anyone. You didn’t know what you should do. You thought of your remaining years and how you would spend them alone. You wondered if your grief would make you unattractive to any future suitor. You wondered if you could go on living in this house, sleeping in this bed. Alone, you felt alone. Marty’s pacemaker just didn’t matter. After all, your heart still beat, and that’s all you heard. When we rotated positions and tried it again, we found a different version of you. In this version, you have no heart. You barely look at Marty’s still body before you pick up the phone and dial an ambulance. “Come quickly, but don’t turn on the emergency lights,” you say, “he’s dead already.” Marty stopped existing and left you, only you. When you answered the question about the pacemaker, you said “no” with finality. There is no pacemaker. There never was. Just put Marty into the flames. Be done. We rotated several times, arriving at variations on these conclusions. Then we heard someone calling from outside. Another sinkhole had opened up, nearly swallowing an elderly widower who had come to place flowers on the grave of his departed. He gripped the flowers and stood before a deep, round hole, all that remained of his dead wife now deep and inaccessible. At least we didn’t have to pull him out. Soon the cemetery would become a great hole and the bereaved would no longer need us—they could bring their dead and toss them into that hole and have the burden of mourning lifted from them forever. Our purpose ended, the three of us would have nothing left for us to do than to throw ourselves down there with the dead. Something caught our eye before we re-entered the building. The Landson family crypt, a splendid marble structure still as yet untouched by the shifting ground. Marty’s family’s mausoleum. If the sight of that structure affected our next role-playing exercise, we did not intend it. We took our places, and this time a darker version of you emerged. You expected to find Marty dead next to you that morning. You expected it because you killed him. You served him poisoned tea before bedtime and lay in bed, barely able to sleep because of anticipation you couldn’t contain. You displayed choreographed grief. We realized what our imitations of you tried to tell us then—that you are an imitation. The imitation of a bereaved woman. Burn up Marty, you told us. Burn him up so no one ever opens his corpse and finds the traces of what I gave him. You feared investigation, discovery, a corpse exhumed. As already stated, we do not do the work of law enforcement. We are undertakers. We undertake our own tasks, not those of others. And our new task called for late night phone calls. When you answered, you didn’t recognize the rasp at first, the breathing. At first, we said nothing, we merely breathed. We didn’t answer. The heightened worry in your voice confirmed what we suspected. Someone discovered your secret. The next day we weaved through the sinkholes and placed Marty’s body inside his family’s mausoleum. We built him a strong coffin. We build all of our coffins. We waited until night before we dialed you again. “Hello?” you said, sensing that the same person had called again. “Who is this? Hello?” The worry had disappeared, replaced by a scornful confidence. We waited three nights before making the next call. The mail moves slowly in Vissaria County. You did not say anything this time. You just picked up the phone and listened. We waited out the silence that followed. Finally, you spoke. “Yes,” you said, for the firmness in the voice you heard would allow no other response. Later, we watched you enter through the cemetery gates, your shadow approaching the mausoleum and reaching out with what we knew to be the key we had mailed you. In the other hand, the knife. Through the door you went while we in turn went inside and ate a late supper, leaving a white handkerchief on the mat outside of our door. The three of us cut off bite sized pieces of meat, imagining you in the cemetery outside. First, you would need to find the coffin containing Marty’s remains. You may not recognize the new handiwork at first, and the stacks of coffins look alike because we built each one of them. Built them the same. You will begin opening them, encountering several moldering remains in your struggle to find the right one. You will think of giving up, ponder the risks of letting Marty rot and decay with his ancestors. But you won’t. You’ll happen upon fresh, unembalmed corpse of your beloved Marty. You’ll gaze upon the rictus of his dead face, for we long ago gave up the practice of drawing scarves around the faces of the departed. At our dinner table, a muffled burp and a fart. Our organs will eventually fail, but not before we face the decision to leap Perhaps we’ll form a chain, one of us grasping the last remaining tombstone while clasping the wrist of the second who holds the third as he looks down, taking a glance before giving the command to let go. What handiwork will you leave us? Do you know the location of the heart, or will you jab and stab and make a mess of the meat in the mausoleum? We cut our bites neatly, knowing that the sight of a gaping hole in Marty’s chest will not affect our appetites after we place him in the crematorium. Later, a knock, and when we answer it, we find no one, just the bloody mess you left for us on the handkerchief. When we light the flames, we will throw in the soiled fabric. As for the pacemaker, we will not burn that of course. For such an explosion we would pay dearly. Instead, we will walk it over to a newly opened sinkhole and toss it in. Along with it will go Marty’s heart, which you left for us as well. You did not keep the two separate, and thus, you confirm our suspicions of you. You cared not a thing for his heart. But we will dispose of it for you, for we are undertakers. Douglas Ford lives and works on the west coast of Florida, just off an exit made famous by a Jack Ketchum short story. His previous work has appeared in Wicked Hollow, Poe Little Thing, Spinning Whorl, as well as other small press publications. 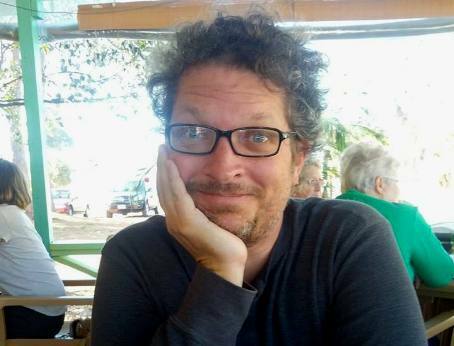 His most recent work has appeared in anthologies published by Big Pulp and A Murder of Storytellers, as well as the multi-media e-zine, Cracked Eye. He lives with his wife who gives him loving support and four cats who merely tolerate him.